there were mighty fells with snowy crowns and with sharp, uncovered teeth, around the valleys through which enormous, broad rivers of ice came flowing to the sea. South Georgia and the South Sandwich Islands are in the sub-Antarctic. They are governed together as a British overseas dependency. The only access is by sea, there are no flights. The South Sandwich Islands on the other hand are isolated and are not often visited other than by survey ships on scientific excursions. The prevailing weather conditions usually make the approach difficult, they rise very steeply out of the sea and are subject to active volcanism. 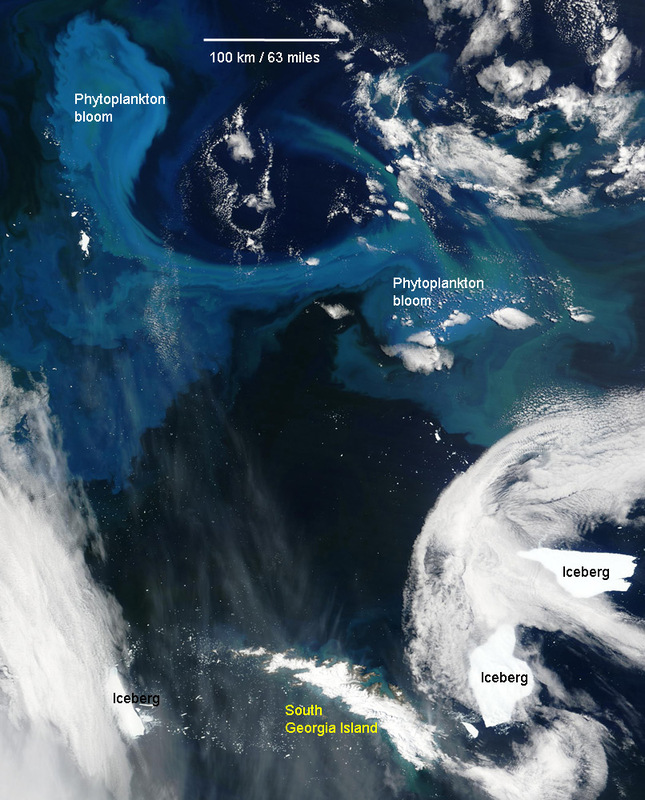 Location - 1290 km (800miles) south east of the Falkland Islands in the South Atlantic Ocean, part of the "Scotia Arc". Territory - 3 755 sq. km. total. Capital - Small settlement at Grytviken. Population - Permanently manned British Antarctic Survey base of up to 18 people. Highest Point - Mt. Paget 2 934m (9 535ft). Location - 750 km (470 miles) south east of South Georgia in the South Atlantic Ocean, part of the "Scotia Arc"
click the picture to explore the larger image. Picture courtesy Ella Derbyshire. Captain James Cook arrived here in 1775, in his report, he mentioned the large numbers of elephant and fur seals. 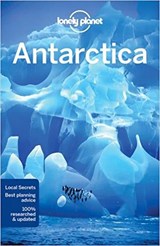 This soon came to the attention of the sealing industry and so started what was to become a bloody period in the history of South Georgia, but also the driving force for much of the early exploration of Antarctica. Early sealers were very secretive in order not to alert other competitive sealing crews of the whereabouts or abundance of seals. They even went as far on occasion to "let slip" details of made-up islands in the hope that other crews would waste their time looking for them (and on occasion it worked) instead of working the known sealing grounds. Records of early activities are therefore rather scant, but it seems that sealers were certainly active on South Georgia from 1786 onwards. The ship Aspasia, collected 57,000 fur seal skins in the 1800/1801 season alone. Sealing continued unabated until eventually (but too late) attempts were made to limit catches, the sealing industry had all but collapsed by 1830. 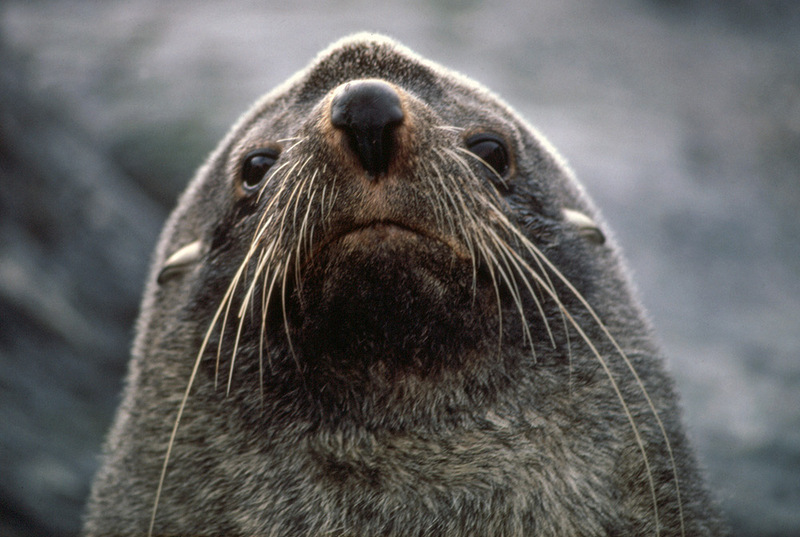 In 1916 only one single male fur seal was seen on South Georgia, it was duly killed. 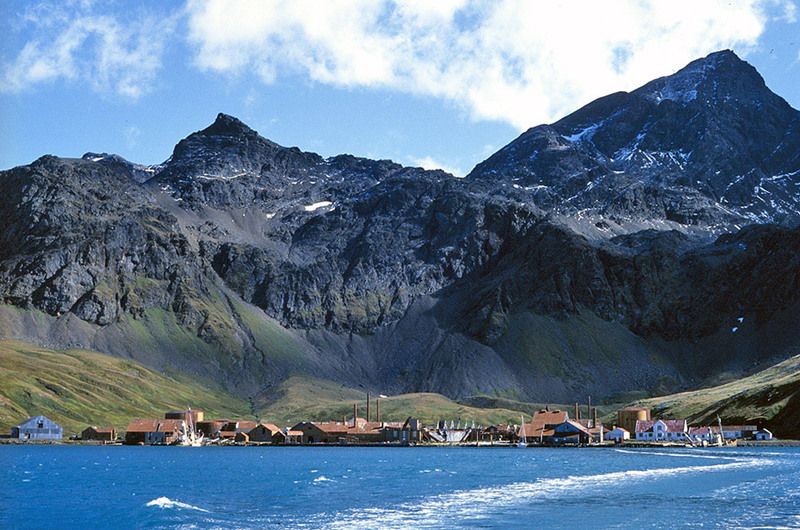 Whaling was the next industry to come to South Georgia when a whaling station was established in what was to become called Grytviken in King Edward Cove in 1904, pictured. From then until the mid 1960's South Georgia was one of the most important places in the world for the whaling industry. Whaling stations were established in seven harbours on the island, thirteen floating factory ships were also used during this time. The whaling stations were abandoned in 1965 and never reopened. They now stand as derelict reminders to the inglorious past. In recent years many of the buildings have collapsed or become damaged to such an extent that they are now closed to all visitors. Grytviken is the one place on South Georgia still occupied today by the scientists and crew of the British Antarctic Survey. The name Grytviken means 'Pot Cove' after the sealers trypots, used for recovering the blubber from seals which were found there. It is the best harbour on the island, being a bay within a bay. South Georgia has strong historical links to the early days of Antarctic exploration. It was visited by Sir Ernest Shackleton and his ship at the start of his Trans-Antarctic Expedition whereby he was attempting to be the first expedition to cross the Antarctic continent from coast to coast via the South Pole. It was also the place where he and four other crew members arrived a year and a half after their ship had been sunk in the Antarctic pack ice in an attempt to rescue the remainder of the crew, left on Elephant Island while Shackleton and his party went for help. Some tour operators offer the chance to follow in Shackleton's footsteps to trek across South Georgia from King Haakon Bay to Stromness over the towering peaks of the islands back-bone, though with rather better modern resources! Grytviken is today the home of a museum to the history of the island and is also the final resting place of Shackleton who died here onboard his ship Quest in King Edward Cove on January 5 1922 en-route to Antarctica. The grave is an often visited site for many passing ships. As well as its fascinating history, and stunning scenery, South Georgia has some of the greatest concentrations of wildlife on earth. Despite the historical massacre of numbers, more than 2 million southern fur seals - 95 percent of the world's population arrive at South Georgia each summer. Half the world's population of southern elephant seals also come here to breed. 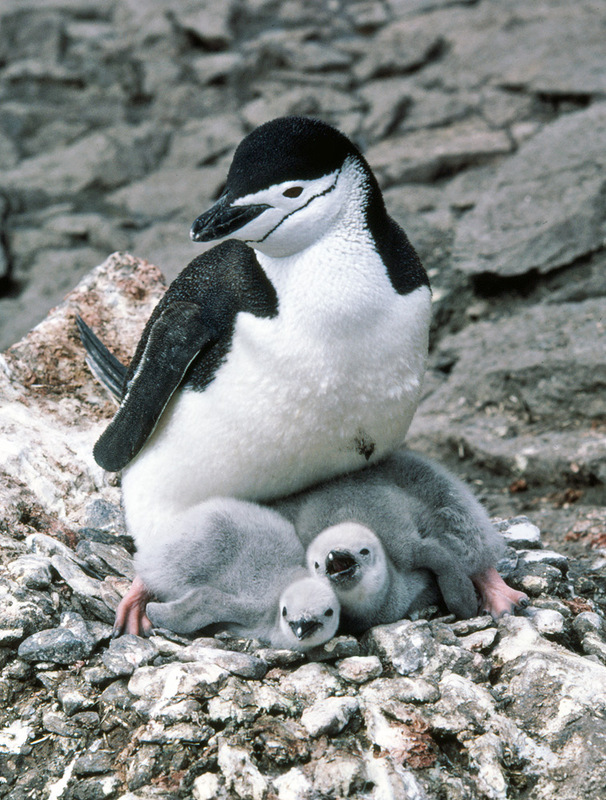 Six penguin species can be found on South Georgia, Macaronis, regal and impressive Kings, cheeky Gentoos and relatively rare (here at least) Adelie, Chinstraps and Rockhoppers. The penguins that live on the island number in the millions, sometimes totally covering entire hillsides.250 000 albatrosses of a variety of species return here each year, including the bird that has the largest wingspan of all at 3m+, the spectacular wandering albatross. An estimated 10 million other seabirds such as various petrels and prions that nest underground are are nocturnal in habit to avoid predators. Two native species only found on South Georgia are the South Georgia pipit, the only songbird in Antarctica, and the South Georgia pintail, the world's only known carnivorous duck. South Georgia may not be Antarctica proper, but it is an absolutely fantastic place, whether for the history, wildlife or the exhilaration of being in such an unspoiled and spectacular environment. The Eastern half of South Georgia, glaciers can been seen coming down from the mountains, to the bottom right, icebergs that have calved from the glacier can be seen floating away. The milky appearance of the sea just offshore is due to fine sediments of "glacial flour" eroded from rock by the islands glaciers. The south coast is towards the top of this picture. A chain of islands, connected by a low submarine ledge, forming an island arc. They were discovered by Captain James Cook, in HMS Resolution, who first sighted the southernmost island later called Southern Thule on the 30th of January 1775. And at those islands there are masses of ice floes, the which are amazing hills of ice up to 30 sazhens (55m) above the water, And those are truly dangerous places. There are frequent terrible storms there and terrible cold and frequent snow-squalls. A single volcanic cone named Mount Curry, approximately 14.5 km (9 miles) in circumference and 550m (1780 ft) in height. Constantly erupting with hot smoke issuing from the cone. 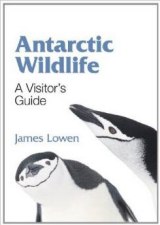 There are around a million breeding pairs of chinstrap penguins on Zavodovski Island, making it one of the world's largest penguin colonies. An occasional call on tourist itineraries. The penguins appear as white dots against the black volcanic earth. Every spare patch of land is covered and the penguins disappear up the mountainside frequently lost in the mist. We found three new islands never visited by mariners before, except for our two ships. And one island (Zavodovski) the land is on fire and smoke pours and moves like clouds. And there at that island three officers and four sailors rowed in to take a look around the island. There are masses of various birds, especially a penguin with yellow crests. It walks like a man, calls like a grebe, the wings are small and it does not fly..... A reward was given for those islands [to] who saw them first, five thalers*, (about 18 months pay) and they were written in the journal. Diary of Able Seaman Yegor Kisilev - December 28th 1819. Leskov Island: The smallest of the group, a flat summit and precipitous on all sides. Visokoi Island: Another single volcanic cone. Candlemass Island and Vindication Island: These two lie about two miles apart and are separated by the Nelson Channel. Candlemass has two peaks, Mount Andromeda and Mount Perseus, there is also a volcanic cone, known as Lucifer Hill. Saunders Island: Roughly crescent shaped. In the middle of the island there is Mount Michael, a glaciated but active volcanic cone. 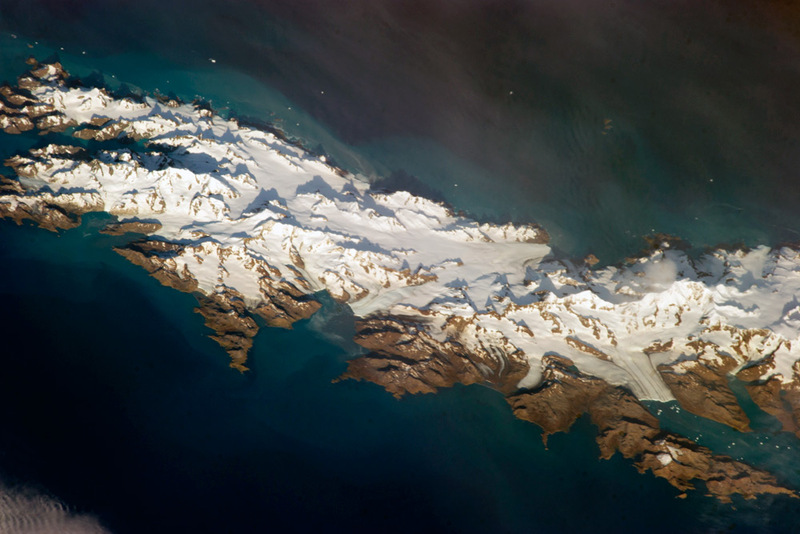 Bellingshausen, Southern Thule and Cook Islands: These form the most southerly of the group. If you pass by the South Sandwich Islands then make sure you remember the event - if only to win a game of one-up-manship one day! 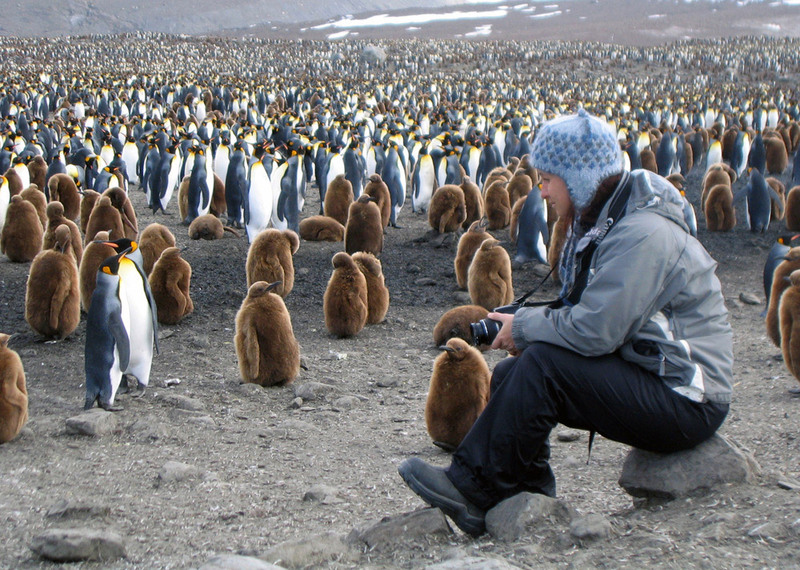 If you land on one of the islands you're either a scientist, hopelessly lost, in a state of some desperation, or possibly a fortunate traveller come to see the extraordinary sight of the penguins on Zavadovski Island. South Sandwich Islands. 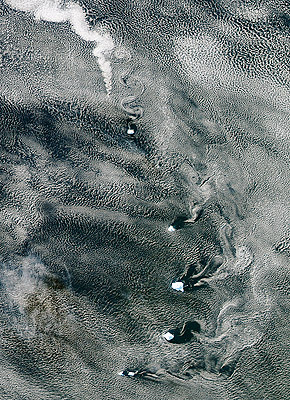 Zavodovski at the top with the spiral plume of clouds forming from the steady stream of gases and aerosols emitted from Mount Curry. The patterns from the other islands are made by disturbances of clouds blowing across them creating wake patterns. April 2012.